Australian designer Marc Newson has designed a speed boat in collaboration with Officina Italiana Design for Italian boat brand Riva. Called Aquariva by Marc Newson, the design is a reinterpretation of the Aquariva boat design that incorporates anodized aluminium and a textile-based laminate with the appearance of wood. The design will be available in an edition of 22 through Gagosian Gallery. More boats in our transport category. 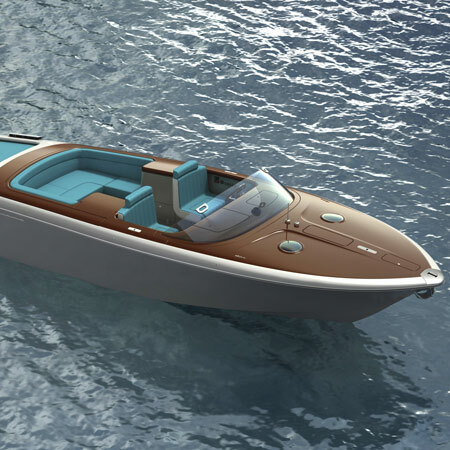 In a highly anticipated collaboration, Marc Newson has partnered with Riva and their official designers, Officina Italiana Design, to reinterpret the 'Aquariva' speedboat. 'Aquariva by Marc Newson' will be launched as a limited edition of 22 units in September 2010, available worldwide through Gagosian Gallery. Newson's design for the Aquariva vessel is unique in its conception, as well as the materials chosen. A wood-like, textile-based laminate (phenolic composite) was used for the deck area and instrument panel. This material was developed in the first half of the 20th century, and was a precursor to fibreglass. While having an ostensibly organic feel and aesthetic, it is significantly more durable than wood. To give the exterior a more high tech look, Newson utilized anodized aluminum, a material not generally associated with boats; this lightweight material is used in lieu of stainless steel and chrome brass, yet remains contextual among Riva’s glamour and classical design. Respecting the DNA of the original project created by Officina Italiana Design was paramount to Newson's design for Aquariva. With this in mind, some of the changes he makes are truly innovative: the re-imagining of the transom (at the stern), the wrap-around, laminated glass windscreen, the split cabin door entry, the functionality of the lounge and dining area, and the re-introduction of separate driver and passenger seats. Aquariva by Marc Newson's simplicity and functionality are what make the boat truly extraordinary. The end product of Newson's design is an uprated Riva complete with a bow thruster and state-of-the-art electronic transmission. "Aquariva by Marc Newson is a natural extension of the artist’s work with planes and automobiles. The result is a brilliant blend of form and function, looking back to La Dolce Vita of the 1950's and 1960's and forward to the latest trends in nautical design," says Larry Gagosian. "I can't wait until it is on the water." Australian born Newson's aesthetic vision and uncompromising originality have won him the highest international acclaim. Working across a broad spectrum of disciplines, Newson has created furniture, interiors, timepieces, objects of all sorts, and sculptural work, as well as major projects in the transportation industry, particularly aviation and aerospace. Appointed a "Royal Designer for Industry" in the United Kingdom, Newson has received numerous design awards and academic honours. He has had solo exhibitions at major museums and galleries, with work featured in the permanent collections of the world's most renowned museums including the Musée National d'Art Moderne, centre Pompidou, Paris, the Museum of Modern Art, New York, and the Victoria and Albert Museum, London. In 2005, Newson was named by Time Magazine as one of the 100 most influential people in the world. "We are proud that Marc Newson has chosen the Aquariva, which we first created in 2001, as the vessel in which to express his vision for nautical design. His design will carry on Aquariva's legacy as a timeless classic, continuing a thread that connects past to present, and tradition to innovation", Officina Italiana Design comments. Opened in 1979 in New York by Larry Gagosian, Gagosian Gallery is one of the world’s foremost modern and contemporary art galleries with nine locations worldwide, including New York, Beverly Hills, London, Rome, Athens, Paris and Hong Kong. Over the last three decades, Gagosian Gallery has presented countless memorable exhibitions of leading international artists and has mounted ambitious, museum-quality exhibitions of the work of modern masters. In 2007, Gagosian Gallery mounted a major exhibition of Marc Newson’s work in New York followed by a second exhibition in 2008 in London. Founded by Mauro Micheli and Sergio Beretta, Officina Italiana Design is the renowned boat design studio that for over 20 years has been officially appointed as Riva's exclusive designers. Officina Italiana Design has given shape and perfection in every detail to the current Riva range, writing a piece of history of the international yachting design. Officina Italiana Design has won a number of international prizes and signed many important projects in the real estate and industrial design sectors, distinguishing from others by the aesthetic high impact of their works. Riva, the iconic Italian boat-maker established in 1842 in Sarnico, is one of the oldest and most celebrated boat-yard in the world. In the 1950s, Carlo Riva created a celebrity persona for the brand based on the famous mahogany range of boats which became iconic. Riva's Aquariva is the natural evolution of the Aquarama, a modern day icon which reinforced Riva's reputation as the epitome of style and luxury. Since 2000, Riva has been part of the Ferretti Group, one of the world leaders in the design, construction and sale of luxury yachts with a unique portfolio of some of the most exclusive, prestigious brands in the nautical world.